One of the great things about going to the Colorado School of Mines is that we get $5 tickets to the Colorado Symphony Orchestra. Which, if I can manage to get a good seat, is a 93% discount. CSO posted their 08/09 schedule over the summer and I took a gander at. One concert immediately caught my attention: Trek: The Concert. I put it on my schedule at least four months ago and this last weekend the moment finally came! I headed down to the Denver Performing Arts Complex and met Smiley and his girlfriend there. We got front row seats and proceeded to enjoy the music of Alexander Courage, Jerry Goldsmith, James Horner, Leonard Rosenman, Cliff Eidelman, and Dennis McCarthy. Between each piece, John de Lancie (Q) and Marina Sirtis Robert Picardo (The Doctor) delivered comedic anecdotes about Star Trek and lore thereof. I hung around for a while afterward, hoping to catch a glimpse and maybe even a photograph or autograph of de Lancie or Picardo. However, surmise they took the back exit. 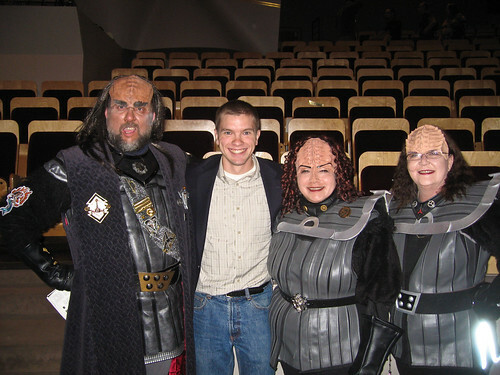 I did manage to get my picture taken with some Klingons though!